You drive over them every day, probably with little thought about when they were built, how they are maintained or what condition they are in. The mid-Hudson Valley’s bridges are a major component of the region’s transportation system, used by commuters, tourists and truck drivers hauling needed goods to and from the area. But nearly four in 10 of them fail to meet structural standards. And more than one in 10 can no longer carry as much weight as they were originally designed to bear. A computer analysis by the Poughkeepsie Journal of state Department of Transportation bridge records revealed that 37 percent of roadway bridges in the DOT’s Region 8, which includes Dutchess and Ulster counties, are considered ‘‘deficient’’ by federal standards. In Ulster County, nearly 43 percent of bridges fall into the deficient category. In Dutchess County, the figure is about 38 percent. State officials and local engineers are quick to point out that ‘‘deficient’’ does not mean the spans are unsafe. But it does mean that they require attention and ‘‘are not functioning as originally designed.’’ For example, there may be significant deterioration of a deck or support structure. State, county and local officials are striving to reduce the number of deficient bridges — the federal goal is to get to 25 percent by 2006 — as best they can. According to a recent study by the Troy-based Institute for Infrastructure Asset Management, New York fares poorly compared to similar states. 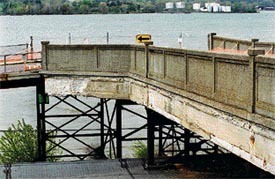 The Hutton Street bridge in Rhinecliff, built in 1913, is the lowest-rated roadway bridge in the Dutchess/Ulster region. State officials have allocated $4.3 million to rebuild the span, which is owned by CSX Corp., purchaser of Conrail. While 39 percent of New York’s bridges are considered deficient, the figure in Pennsylvania is 25 percent, and in New Jersey, 17 percent. Those are considered to be peer states because of their size, population and climate. New York had the highest percentage of deficient bridges in a 1998 ranking by the federal government. Thirteen years after a New York state Thruway Authority bridge collapsed into the Schoharie Creek, killing 10 people and raising the alarm on bridge safety, progress in most areas has been slow. In DOT’s Region 8, which also includes Columbia, Orange, Putnam, Rockland and Westchester counties, state figures show that the number of deficient bridges has shrunk slightly from just over 39 percent in 1996 to just over 37 percent today. Dutchess reduced its tally by less than 2 percentage points, while Ulster’s proportion of deficient bridges dropped by about 8 points. County-owned bridges fared worse than state-owned bridges. In Ulster, 42 percent of county-owned bridges were deficient, compared to 35 percent of DOT bridges. In Dutchess, 50 percent of county-owned bridges were deficient, while only about 19 percent of DOT-owned bridges fit that category. Of 29 state Thruway-owned bridges in Ulster County, 14 — or 48 percent — were found to be deficient. Things will not dramatically improve any time soon unless substantially more funding is secured, said one regional DOT official. Thirty-eight percent of roadway bridges in Dutchess County and 43 percent in Ulster were rated deficient in state inspections; the federal goal is to reduce that proportion to 25 percent nationally by 2006. A bridge is considered deficient when one or more components isn't functioning as designed; it does not necessarily refer to safety. County, state and local officials all say they are working diligently to repair the worst of the bridges in the region. Terry O’Brien, a spokesman for the Thruway, acknowledged the authority’s bridges need to be improved. But the difficulties in reducing the number of deficient bridges, experts say, are myriad. Many of the bridges are getting older and were not designed to handle the heavy traffic of today’s growing region. Critics also point to a lack of money to properly maintain bridges. ‘‘They need to increase the funding level,’’ said George Drapeau III of the Construction Industry Council of Westchester and Hudson Valley. The group recently commissioned a report that recommends the state allocate $5.6 billion for bridges over an eight-year period. ‘‘That would keep the pace with the current deterioration and it attacks the backlog,’’ Drapeau said. State DOT spokeswoman Colleen McKenna said Region 8 spends $45 million per year on bridge construction — a number that has remained constant over the past five years. Region 8 also spends $6.5 million per year to inspect the area’s 2,600 roadway bridges. According to the Journal’s study of state records, the worst bridges in the area include a 1913-vintage, steel-girder bridge over railroad tracks in Rhinecliff to a 1934 steel-truss bridge over the Rondout Creek in Rosendale. Replacing even what most people would consider a small bridge is expensive. For example, a bridge on Main Street in Kerhonkson, used by 2,200 vehicles daily, will cost about $1.1 million when it is replaced next year, officials said. The Hutton Street bridge in Rhinecliff could cost more than $4.3 million, money that should be allocated in this year’s budget. The DOT inspects many of the bridges statewide, although some are inspected by private firms under contract to the state or various authorities who own the bridges. But the DOT collects data on all the bridges statewide and forwards the information to the Federal Highway Administration in Washington, D.C.
Local DOT officials said their inspectors do a good job of keeping up with inspections, which are required on each bridge every two years. Owners of various bridges are responsible for their upkeep. For example, the state Thruway Authority maintains its bridges, as do local towns, counties and railroads. ‘‘I think the inspectors themselves have a tremendous amount of experience, and they are very competent in what they do,’’ said Richard Dillman, an associate civil engineer with the DOT’s Region 8 office in the Town of Poughkeepsie. Region 8 has three in-house teams of two inspectors and pays a consultant to deliver another three teams. Experts say there are three key factors that have led to the number of deficient bridges in New York — age, climate and volume. ‘‘New York has a lot of bridges and a lot of older bridges,’’ said David Densmore, the director of bridge technology with the Federal Highway Administration. The average age of the 25 bridges with the lowest ratings in Ulster and Dutchess counties is 67 years, the Journal found. Bridges owned by the state Department of Transportation are generally in the best shape of the nearly 750 roadway bridges in Dutchess and Ulster counties; higher percentages of local- and county-owned bridges are considered deficient. Dillman of the DOT agreed that the age of the bridges is a factor in deficient ratings. ‘‘Mostly the cause is that the bridges have deteriorated over time,’’ Dillman said. Age and volume are related factors: Bridges deteriorate faster when they under the strain of carrying more traffic than they were designed to handle. ‘‘These things were not designed for the kind of volume they are now accommodating,” Drapeau said. Weather is also a factor, experts say. Hot summers and cold and snowy winters don’t help in the fight to keep the bridges in good repair. ‘‘If the same bridge built in New York is built in Florida, you get twice the life out of it in Florida,’’ said Jim Donahue, commissioner of Ulster County’s Department of Public Works. The Federal Highway Administration keeps tabs on the number of deficient bridges in each state, collecting data and working with various state transportation departments to reduce those figures. Densmore said national bridge inspection standards were implemented in the mid-1970s, requiring bridges to be inspected every two years. The standards also require the states to keep an inventory of bridge conditions. That list is updated annually. The FHA has also set nationwide goals for the coming years. The agency hopes to reduce the number of deficient bridges on the National Highway System to fewer than 20 percent by 2006. Overall, the agency wants to improve the condition of all bridges nationwide so that fewer than 25 percent are deficient by then. Densmore said the states split about $3.2 billion in federal money for bridge upkeep and repair each year. New York gets 10 percent of that figure, the most allowable. How much funding each state receives is determined by the square footage of deficient bridges and the construction costs in that state, Densmore said. Dutchess County is responsible for maintaining about 140 bridges, according to John Tekben, the county’s director of engineering. All those bridges are inspected by the DOT. Tekben said the county is constantly trying to keep its bridges in good shape. Tekben said the county hopes to replace six bridges in the coming year. They include one on Noxon Road in the Town of LaGrange, one on Carpenter Road in East Fishkill and another on Swamp Road in the Town of Dover. He said increased volume on bridges built during a more bucolic era has led to some bridges having to be replaced. Ulster County has been able to reduce its number of deficient bridges, and officials said one reason why may be that the county began about five years ago to repair and replace deficient bridges in-house, rather than going out to bid. Both the state Thruway Authority and Bridge Authority inspect their own bridges, or contract the work out. The results are then forwarded to the DOT. Of the Bridge Authority’s five spans, only the Kingston-Rhinecliff Bridge is rated as deficient, according to authority officials. Its problems are already being addressed by a three-year redecking project that began a few weeks ago. The authority inspects its bridges annually. ‘‘It helps with our maintenance program and our capital program,’’ said Bill Moreau, the authority’s chief engineer. He said the authority spends about $400,000 per year on inspections. In addition to the Kingston-Rhinecliff, the authority operates the Mid-Hudson, Newburgh-Beacon, Bear Mountain and Rip Van Winkle bridges. Moreau said keeping the bridges in top shape is challenging. But the authority will spend about $120 million in a capital program called ‘‘Bridges for the 21st Century,’’ a major effort to keep the bridges in good condition. Drivers will pay for the program through a recent 25-cent toll increase, to $1, that went into effect in February. Thruway Authority officials also said they are fighting aging bridges. ‘‘The age is certainly a factor and how much traffic you get on it,’’ said authority spokesman O’Brien, adding that many bridges are scheduled for replacement.